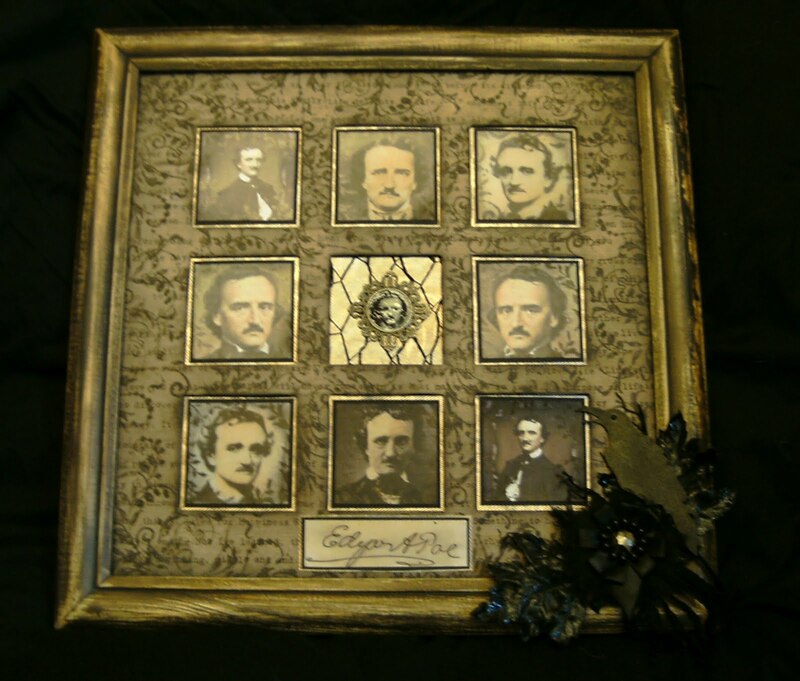 I am so pleased to have found so many folk who share my passion for E.A.Poe.... i used to think i was maybe a little strange.... but i now know that i at least am not alone in my strangeness. It may take the form of anything your little hearts desire but must contain therein his wondrous countenance. 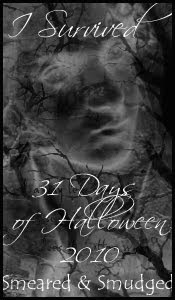 ....... thats our challenge for the next two weeks.... make something...anything.... using any thing you want to use with the Masters likeness. My piece is a framed 12''x12'' art piece. The images are all from the internet. Stamped on and altered my me. The mount is stamped ...distressed...inked and distressed some more. 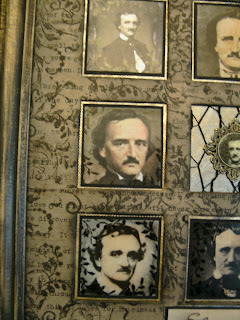 The centre piece is a small cameo of Poe in a brass bezil with mess over embossed foil card. The frame has been painted, distressed, painted again, distressed again then rubbed over with metallic paste. The embellishment in the corner is made from some silk leaves that i painted then heat embossed.... i love the look you get doing that.... and the flower thing i made up from other bits in my fabric scrap box. The raven is a TH die cut.... rubbed over with metallic paste. 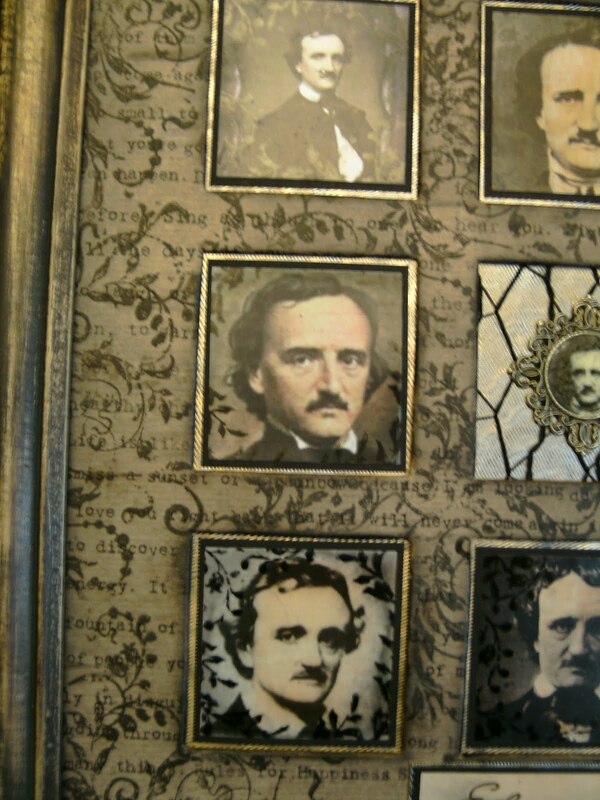 I hope that you'll find time to join us.... i love nothing better than coming to see Poe art work. 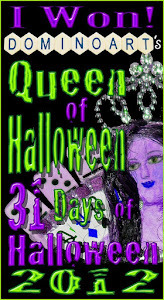 http://anythingchallenge.blogspot.com/ THE ONE I LOVE. Wow, this is am amazing piece of work. I cannot image how long it took you to make. Thank you for sharing it with us at Crafty Boots Challenges. WOW! This is amazing!!!!! a stunning piece of art!! !.....I love the floral embellishments you have used.... they are to die for! This is amazing and looks as though it should be hanging in a museum or a Victorian era home. So lush and vintage and beautiful. High dollar art right there!!! Too bad you don't have an Etsy shop to sell stuff like this!!! this is beautiful! I love all that you have done with it! you have such an awesome passion for Poe and it comes out in your work! I agree with Glowbugg...it should be in a museum! Such a gorgeous piece, Lynx! 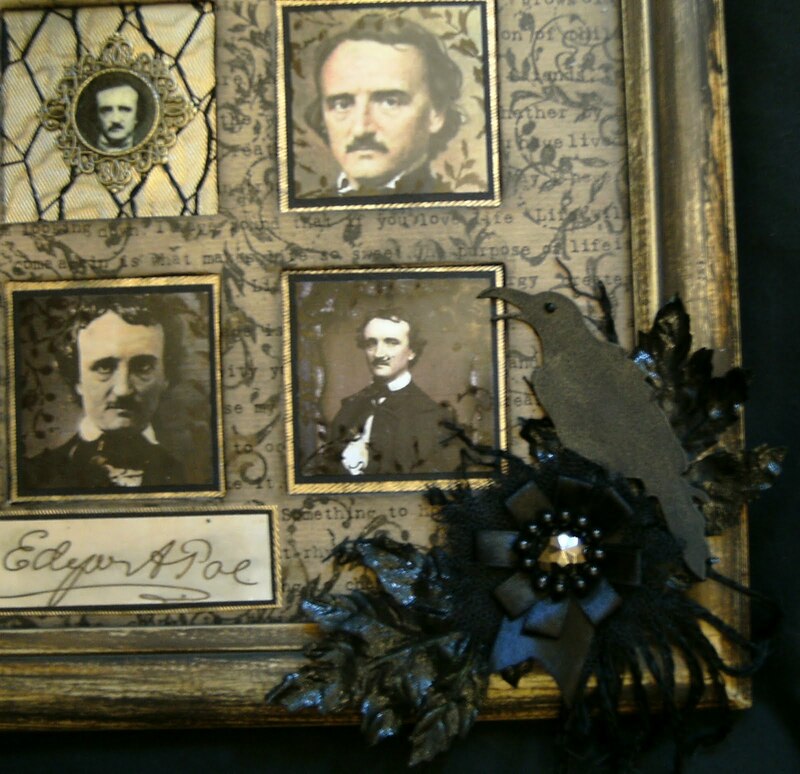 That's a wonderful Poe creation. I used to be able to quote The Raven, but nevermore. Sorry, couldn't resist. 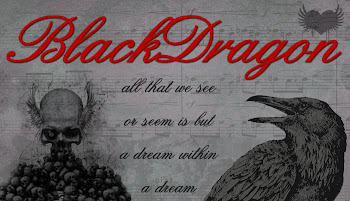 :-) You've created a wonderful period piece. Thanks for sharing it with us at Papercraft Star! Wow, this is fabulous! Love it. So glad you shared with us at the Creative Belli challenge! Wow is right! This is wonderful! 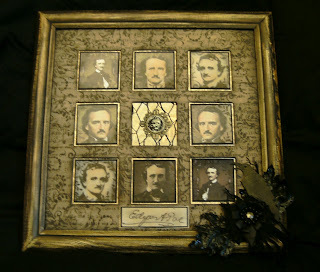 I love that I can totally get how you feel about Poe from this beautiful creation. The embellishments in the corner are just perfect! Thank you for sharing this with us over at the Papercraft Star! This is just truly awesome! Everything you touch comes out gold! Meaning, I so bow down to your skills! I just love this too!